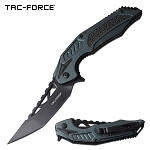 The up-swept tanto blade is 3.6 inches long and constructed from 3cr13 steel. Two tone anodized aluminum handle is 4.75 inches long for a good grip. Cool knife design. The pocket knife with a specially designed knife blade and spring assisted opening knife action makes it a killer combination for a EDC knife. This wholesale knife has a overall open length of 8.35 inches. The up-swept tanto blade is 3.6 inches long and constructed from 3cr13 steel. Two tone anodized aluminum handle is 4.75 inches long for a good grip.